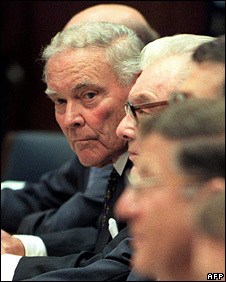 Former US Secretary of State Alexander Haig has died at the age of 85. Mr Haig had been admitted to Johns Hopkins Hospital in Baltimore on 28 January with complications associated with an infection, his family said. He was chief-of-staff to President Richard Nixon during the Watergate scandal in the early 1970s. Mr Haig was perhaps best known for his bungled response when President Ronald Reagan was shot in 1981, erroneously telling reporters he was “in control”. Mr Haig maintained that he was simply trying to keep the country calm, but he was widely derided for apparently trying to overstep his authority. A spokesman for Johns Hopkins Hospital, Gary Stephenson, said that Mr Haig had passed away at about 0130 (0530 GMT) on Saturday. BBC defence correspondent Rob Watson says Mr Haig was the ultimate Cold War warrior. A decorated hero in both the Korean and Vietnam wars, he rose to the rank of general before continuing the fight via the conservative politics of the Republican Party of the 1970s and 80s, our correspondent says. In 1973, he was asked to take over as President Nixon’s chief of staff at a time when the administration was in serious trouble. Mr Haig was widely credited with saving the presidency from complete collapse over Watergate, and persuading Nixon to resign. He then stayed on as chief of staff to Gerald Ford, Nixon’s successor. After a brief return to the military as Nato’s Supreme Allied Commander, Mr Haig was back in Washington in 1981 as President Reagan’s hawkish secretary of state. During that time, he courted controversy by suggesting the possible use of nuclear weapons as a warning to the Soviets. “There are contingency plans in the Nato doctrine to fire a nuclear weapon for demonstrative purposes, to demonstrate to the other side that they are exceeding the limits of toleration in the conventional area,” he said. He also led failed US diplomatic efforts to negotiate between the UK and Argentina before the Falklands War, in the so-called “peace-shuttle” talks. In 1988, he ran for the Republican presidential nomination but was beaten by the more moderate Vice-President George H W Bush, a loss which marked the end of his political career. Spanish judges have agreed to consider charging six former US officials with providing legal justification for alleged torture at Guantanamo Bay. Human rights lawyers brought the case against the six, who all served under former President George W Bush. Among those named was former defence official Douglas Feith, who said the charges against him “made no sense”. Spanish courts can prosecute offences such as torture or war crimes even if they occurred in other countries. The former officials – who include ex-Attorney-General Alberto Gonzalez – could face arrest on leaving the US if the courts decide to issue warrants. The lawyers who brought the case accuse the six of providing legal cover to allow the security services to use techniques of interrogation such as “waterboarding”. They say the methods amounted to torture. Mr Feith, a former under-secretary for defence, rebuffed the accusations. “The charges as related to me make no sense,” he said. The lawyers took their accusations to Judge Baltasar Garzon, who agreed to allow state prosecutors to decide if the case has merit. Judge Garzon was responsible for bringing a prosecution against former Chilean leader Augusto Pinochet, who was arrested in the UK in 1998. Spain’s courts have also launched investigations over alleged crimes in Argentina, Tibet, El Salvador and Rwanda. The US and Palestinian Authority President Mahmoud Abbas have backed a French-Egyptian ceasefire proposal. On the ground in Gaza, explosions were heard through the night. Israel says it carried out more than 30 air strikes. Mr Ban criticised both Israel for its bombardment of Gaza and Hamas for firing rockets into Israel and urged Security Council members in New York to act “swiftly and decisively to put this crisis to an end”. “We need urgently to achieve Palestinian unity and the reunification of Gaza with the West Bank within the framework of the legitimate Palestinian Authority,” he added. More than 600 Palestinians are now believed to have been killed since Israel began its offensive 11 days ago. Palestinian health ministry officials say at least 195 children are among those killed. Israel, which has vowed to reduce rocket attacks from Gaza on its territory, has lost seven soldiers on the ground. Four people within Israel have been killed by rockets. In another development, Venezuela ordered the expulsion of Israel’s ambassador in protest at the Gaza offensive and its “flagrant violations of international law”. The ceasefire plan proposed jointly by Egyptian President Hosni Mubarak and French President Nicolas Sarkozy would bring together all the main parties and take all measures to end the conflict in Gaza. Welcoming the proposal, US Secretary of State Condoleezza Rice called for a “ceasefire that can endure and that can bring real security”. The contours of a possible diplomatic agreement are in place, the BBC’s Laura Trevelyan reports from the UN. Israel’s ambassador to the UN, Gabriela Shalev, did not say whether Israel would accept the proposal but said it would take it “very, very seriously”. Israel has proposed suspending attacks in specified parts of Gaza to allow people to stock up on essential goods. The military will open up “areas for limited periods of time, during which the population will be able to receive the aid”, the office of Israeli Prime Minister Ehud Olmert has said. Israel’s air assault on Gaza is “the first in several stages” of operations aimed at ending militant rocket fire, Prime Minister Ehud Olmert has said. As bombing continued for a fourth day, another top official said Israel was ready for “long weeks of action”. Palestinian officials say more than 360 people have been killed since Saturday. Four Israelis have died in rocket fire. As EU officials prepared to discuss the crisis, some reports from Israel said it was considering a temporary truce. Mr Olmert was set to discuss the idea of a 48-hour suspension, suggested by France, with his officials later in the day, the French news agency AFP said. But Infrastructure Minister Benjamin Ben-Eliezer warned a truce would allow militant group Hamas – which controls Gaza – “to regain strength… and prepare an even stronger attack against Israel”. US President Bush agreed in a telephone conversation with Palestinian President Mahmoud Abbas that for any ceasefire to be effective it had to respected by Hamas, the White House said. A BBC reporter says Israeli tanks and troops are massed along Gaza’s border. Correspondents say this could be a prelude to ground operations, but could also be intended to build pressure on Hamas. European Union foreign policy chief Javier Solana called for an immediate ceasefire and the opening of crossings to allow humanitarian aid into Gaza, as EU foreign ministers prepared to discuss the crisis in Paris. On Tuesday, Israeli jets attacked more targets linked to Hamas, hitting a number of government buildings and security installations. At least 10 people were killed and 40 said to have been wounded in the raids. 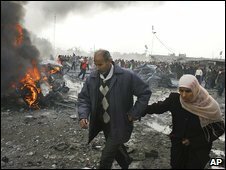 One air strike killed two sisters, the eldest aged 11, riding in a donkey cart in Beit Hanoun, northern Gaza, Palestinian medical sources said. The UN has called for an investigation into the attacks, which are causing heavy civilian casualties. It says at least 62 of the Palestinians killed so far were women and children. Richard Falk – the UN special rapporteur for human rights in the Palestinian territories – said the international community must put more pressure on Israel to end its assault. “Israel is committing a shocking series of atrocities by using modern weaponry against a defenceless population – attacking a population that has been enduring a severe blockade for many months,” Mr Falk said in a BBC interview. But Israeli officials said there was more to come. The Israeli military “has made preparations for long weeks of action”, deputy defence minister Matan Vilnai said. Mr Olmert’s statement that the bombardment was “the first of several stages approved by the security cabinet” was quoted from a briefing he gave to President Shimon Peres on Tuesday. Separately, Israeli naval vessels confronted pro-Palestinian activists seeking to break the Gaza blockade by boat. The activists said one vessel rammed them; their boat made port in Lebanon with heavy damage on one side. The Egyptian-Gaza border was due to be opened to permit more trucks carrying aid to enter the territory, and for wounded Palestinians to be transported to Egyptian hospitals. Egyptian President Hosni Mubarak, under popular pressure to open the crossing fully, said that could not happen while Hamas, rather than the Palestinian Authority, led by its rival Fatah, controlled the border. Demonstrators in Yemen, angered by Egypt’s co-operation with the blockade on Gaza, briefly stormed the country’s consulate in Aden, where they burned an Egyptian flag and hoisted a Palestinian one. There have been angry protests against the Israeli offensive in many other cities across the Arab world and in several European capitals. Hamas has pressed on with rocket and mortar assaults, killing three Israeli civilians and a soldier in areas that have not previously suffered such fatalities. Israeli military officials said rocket attacks landing more than 25 miles (40km) from Gaza put nearly 10% of Israel’s population of seven million within range. Israeli political leaders have been under pressure to act against rocket fire with a general election looming in early February. Opposition leader Binyamin Netanyahu has backed the offensive, telling the BBC that “Israel is using a fraction of its power to try to target surgically the terrorists”. The strikes began less than a week after the expiry of a six-month-long ceasefire deal with Hamas, which has controlled Gaza since 2007. Correspondents say short of a full-scale invasion of Gaza, it is unlikely Israel will be able to prevent rocket fire permanently. Israel dismantled its strategic settlements and military bases in Gaza in 2005 but has kept tight control over access in and out of the narrow coastal strip and its airspace. 16. Israeli soldier killed at unspecified military base near Nahal Oz border crossing – five other soldiers wounded in same rocket attack, Monday night. Caroline Kennedy’s latest attempt to press her case to be the replacement for Hillary Clinton as a senator for New York has been widely criticised in the US media. Ms Kennedy – daughter of former President John F Kennedy – broke weeks of silence on her bid, by giving a series of interviews at the weekend. But she was criticized for being unknowledgeable on key policy areas, being unable to articulate why she was seeking public office for the first time – and even for possessing a verbal tic. Under the headline “Caroline Kennedy no whiz with words”, the New York Daily News mimicked Ms Kennedy’s speech pattern during the round of interviews. “Caroline Kennedy, you know, might need, you know, a speech coach, um, if she, you know, wants, um, to be a senator,” the paper said. Totting up the number of “verbal tics” during its 30-minute interview, the paper counted “you know” more than 200 times… and added that “‘um’ was fairly constant, too”. Asked if President George W Bush’s tax cuts on the wealthy should be repealed immediately, Ms Kennedy replied: “Well, you know, that’s something, obviously, that, you know, in principle and in the campaign, you know, I think that, um, the tax cuts, you know, were expiring and needed to be repealed,” the paper reported. It consulted experts to give their opinion on her speaking manner. One said it was not necessarily an indication of weakness or doubt, just inexperience. Another advised her to get coaching, to pause more often, and “to listen to her father”. The New York Post also counted up the number of times Ms Kennedy said “you know” during its interview – 235 times in 41 minutes – “which works out to saying the phrase once every 10.5 seconds,” it said. The speech expert it consulted described it as a “very, very common” verbal tic called a “vocalized pause,” and said it was a “Kennedyism” as demonstrated by her uncle. The Associated Press said “Kennedy offered no excuses for why she failed to vote in a number of elections since registering in New York City in 1988”. AP reported that “since word of her interest leaked out in early December, Kennedy has faced sometimes sharp criticism that she cut in line ahead of politicians with more experience and has acted as if she were entitled to it because of her political lineage”. “[Ms Kennedy] still seemed less like a candidate than an idea of one: forceful but vague, largely undefined and seemingly determined to remain that way,” the paper said. The Times said Ms Kennedy spoke “knowledgeably about education issues”. 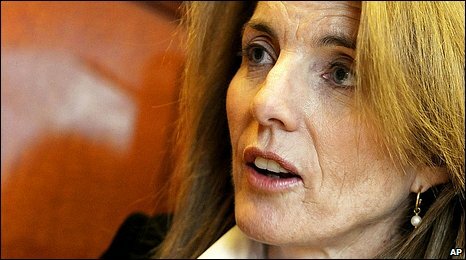 Ms Kennedy “seemed irritated” when asked to describe the moment she decided to seek the Senate seat. She said “she couldn’t recall”, the article said. Huffington Post writer Diane Tucker gave her take on the emphasis other media were placing on Ms Kennedy’s speech patterns. “The real reason her interview is riddled with ‘you knows’ is because she mocked the two Times reporters halfway through the interview. Tucker adds: “We Americans are a kind-hearted people, and we have always felt deeply sorry for her loss. Couldn’t we make it up to Kennedy by gifting her a Senate seat? Wouldn’t that be nice? Israeli F-16 bombers have pounded key targets across the Gaza Strip, killing more than 200 people, local medics say. Most of those killed were policemen in the Hamas militant movement, which controls Gaza, but women and children also died, the Gaza officials said. About 700 others were wounded, as missiles struck security compounds and militant bases, the officials said. Israel said it was responding to an escalation in rocket attacks from Gaza and would bomb “as long as necessary”. They were the heaviest Israeli attacks on Gaza for decades. More air raids were launched as night fell. The operation came days after a truce with Hamas expired. Israeli Defence Minister Ehud Barak said “it won’t be easy and it won’t be short”. “There is a time for calm and a time for fighting, and now the time has come to fight,” he said. UN Secretary-General Ban Ki-moon called for an immediate halt to the violence, condemning what he called Israel’s “excessive use of force leading to the killing and injuring of civilians” and “the ongoing rocket attacks by Palestinian militants”. Middle East envoy Tony Blair and the French EU presidency also urged an immediate ceasefire. Palestinian militants frequently fire rockets against Israeli towns from inside the Gaza Strip; large numbers of rocket and mortar shells have been fired at Israel in recent days. In a statement, Israel’s military said it targeted “Hamas terror operatives” as well as training camps and weapons storage warehouses. A Hamas police spokesman, Islam Shahwan, said one of the raids targeted a police compound in Gaza City where a graduation ceremony for new personnel was taking place. At least a dozen bodies of men in black uniforms were photographed at the Hamas police headquarters in Gaza City. Israel said operations “will continue, will be expanded, and will deepen if necessary”. 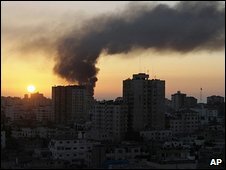 It is the worst attack in Gaza since 1967 in terms of the number of Palestinian casualties, a senior analyst told the BBC in Jerusalem. Israeli Foreign Minister Tzipi Livni defended the air raids, saying Israel had “no choice”. “We’re doing what we need to do to defend our citizens,” she said in a television broadcast. Israel hit targets across Gaza, striking in the territory’s main population centres, including Gaza City in the north and the southern towns of Khan Younis and Rafah. 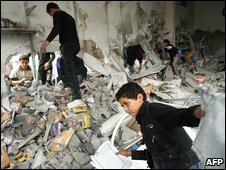 Hamas said all of its security compounds in Gaza were destroyed by the air strikes, which Israel said hit some 40 targets. Mosques issued urgent appeals for people to donate blood and Hamas sources told the BBC’s Rushdi Abou Alouf in Gaza that hospitals were soon full. In the West Bank, Palestinian Authority President Mahmoud Abbas – whose Fatah faction was ousted from Gaza by Hamas in 2007 – condemned the attacks and called for restraint. But Hamas quickly vowed to carry out revenge attacks on Israel in response to the air strikes, firing Qassam rockets into Israeli territory as an immediate reply. One Israeli was killed by a rocket strike on the town of Netivot, 20 kilometres (12 miles) east of Gaza, doctors said. “Hamas will continue the resistance until the last drop of blood,” spokesman Fawzi Barhoum was reported as saying. The air strikes come amid rumours that an Israeli ground operation is imminent. World leaders urged both sides to halt the violence. A White House spokesman said the United States “urges Israel to avoid civilian casualties as it targets Hamas in Gaza”. “Hamas’ continued rocket attacks into Israel must cease if the violence is to stop,” the spokesman, Gordon Johndroe, added. At least 30 missiles were fired by F-16 fighter bombers. Israel’s Haaretz newspaper reported that about 60 warplanes took part in the first wave of air strikes. Egypt opened its border crossing to the Gaza Strip at Rafah to absorb and treat some of those injured in the south of the territory. Most of the dead and injured were said to be in Gaza City, where Hamas’s main security compound was destroyed. The head of Gaza’s police forces, Tawfik Jaber, was reportedly among those killed. Residents spoke of children heading to and from school at the time of the attacks, and there were fears of civilian casualties. Israeli security officials have been briefing about the possibility of a new offensive into Gaza for some days now. But most reports centred on the possibility of a ground offensive, and Prime Minister Ehud Olmert was not expected to authorise any operation until Sunday at the earliest. Although a six-month truce between Hamas and Israel was agreed earlier this year, it was regularly under strain and was allowed to lapse when it expired this month. Hamas blamed Israel for the end of the ceasefire, saying it had not respected its terms, including the lifting of the blockade under which little more than humanitarian aid has been allowed into Gaza. Israel said it initially began a staged easing of the blockade, but this was halted when Hamas failed to fulfil what Israel says were agreed conditions, including ending all rocket fire and halting weapons smuggling. Israel says the blockade – in place since Hamas took control of Gaza in June 2007 – is needed to isolate Hamas and stop it and other militants from firing rockets across the border at Israeli towns. During the trip, Mr Bush and Iraqi PM Nouri Maliki signed the new security agreement between their countries. The pact calls for US troops to leave Iraq in 2011 – eight years after the 2003 invasion that has in part defined the Bush presidency. Speaking just over five weeks before he hands over power to Barack Obama, Mr Bush also said the war in Iraq was not over and more work remained to be done. His previously unannounced visit came a day after US Defence Secretary Robert Gates told US troops the Iraq mission was in its “endgame”. 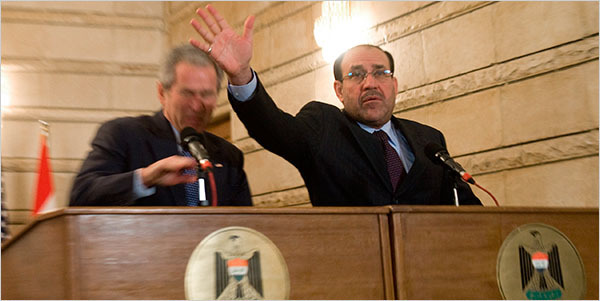 In the middle of the news conference with Mr Maliki, a reporter stood up and shouted “this is a goodbye kiss from the Iraqi people, dog,” before hurtling his shoes at Mr Bush, narrowly missing him. “All I can report is a size 10,” Mr Bush said according to the Associated Press news agency. The shoe thrower was taken away by security guards and the news conference continued. Correspondents called it a symbolic incident. Iraqis threw shoes and used them to beat Saddam Hussein’s statue in Baghdad after his overthrow. Mr Bush’s first stop upon arriving in Baghdad was the Iraqi presidential palace in the heavily-fortified Green Zone, where he held talks with President Jalal Talabani. “The work hasn’t been easy but it’s been necessary for American security, Iraqi hope and world peace,” Mr Bush said during his talks with Mr Talabani. The Iraqi president called Mr Bush “a great friend for the Iraqi people, who helped us liberate our country”. The key issue at present is exactly how American troops will withdraw within the next three years and what sort of Iraq they will leave behind. The US media has just published details of a US government report saying that post invasion reconstruction of Iraq was crippled by bureaucratic turf wars and an ignorance of the basic elements of Iraqi society. The report is circulating among US officials in draft form, says the New York Times. It reveals details of a reconstruction effort that cost more than $100bn (£67bn) and only succeeded in restoring what was destroyed in the invasion and the widespread looting that followed it, the newspaper said. 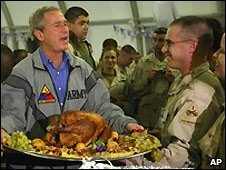 Mr Bush’s visit, unannounced in advance and conducted under tight security, follows the approval last month of a security pact between Washington and Baghdad that calls for US troops to be withdrawn from Iraq by the end of 2011. US troops are first to withdraw from Iraqi cities, including Baghdad, by June next year. Defence Secretary Gates said on Saturday that “the process of the drawdown” had begun. The end in sight for US troops in Iraq? “We are, I believe, in terms of the American commitment, in the endgame here in Iraq,” he told US troops at an airbase near Baghdad. Mr Gates has been picked to stay on as defence secretary by President-elect Barack Obama. President Bush leaves the White House in less than six weeks. He said in a recent interview with ABC News that the biggest regret of his presidency was the false intelligence that Iraq had weapons of mass destruction. Finding these was one of the key justifications for the invasion. None were ever found. Mr Obama has promised to bring home US combat troops from Iraq in a little over a year from when he takes office in January. 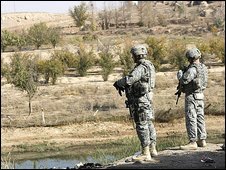 More than 4,200 US troops and tens of thousands of Iraqi civilians and security personnel have been killed since the invasion in 2003. There are currently about 149,000 US soldiers in Iraq, down from last year’s peak of 170,000 after extra troops were poured in to deal with a worsening security situation. As Mr Bush arrived in Baghdad, Gen David Petraeus, the head of the US Central Command, which includes Iraq, said attacks in the country had dropped from 180 a day in June 2007 to 10 a day now. In a sign of modest security gains in Iraq, Mr Bush was welcomed with a formal arrival ceremony – a flourish that was not part of his previous three visits. He arrived in the country on Air Force One, which landed at Baghdad International Airport in the afternoon, after a secretive Saturday night departure from Washington on an 11-hour flight. The two US vice-presidential candidates have traded blows on the financial crisis, climate change and foreign policy in their only TV debate. Democrat Joe Biden sought to link Republican presidential candidate John McCain to the policies of President Bush, saying he was “no maverick”. 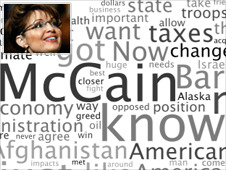 Republican Sarah Palin defended herself against claims of inexperience and said the McCain ticket would bring change. Voter polls suggested Mr Biden had won but Mrs Palin did better than expected. The debate at Washington University in St Louis, Missouri, was seen as particularly crucial for Mrs Palin, whose poll ratings have fallen. Mrs Palin played to her strengths and her image as a mother in touch with ordinary Americans. For the most part she spoke fluently but simply about the economy, climate change and the war in Iraq, our correspondent says, and there were few of the stumbling gaffes that have become the staple of late-night comedy shows. Two polls conducted after the debate, by US networks CNN and CBS News, judged Mr Biden the winner. However, the CNN poll found a large majority thought Mrs Palin had done better than expected. Asked by moderator Gwen Ifill who was at fault for the current problems with the US banking system, Mrs Palin blamed predatory lenders and “greed and corruption” on Wall Street. Senator McCain would “put partisanship aside” to help resolve the crisis, she said, and had raised the alarm over mortgage giants Fannie Mae and Freddie Mac long ago. She said “Joe six-packs and hockey moms across the country” – referring to middle-class voters – needed to say “never again” to Wall Street chiefs. Mrs Palin also accused Democratic presidential candidate Barack Obama of seeking to raise taxes but Mr Biden rejected that claim. He said the economic crisis was evidence that the policies of the past eight years had been “the worst we’ve ever had” and accused Mr McCain of being “out of touch” on the economy. Senator Obama’s plan to raise taxes on households earning over $250,000 was “fairness”, Mr Biden said, unlike Mr McCain’s proposals for more tax breaks for big companies. On foreign policy, Mrs Palin accused Mr Obama of refusing to acknowledge that the “surge” strategy of extra troops in Iraq had worked. “It would be a travesty if we were to quit now in Iraq,” she said, describing Mr Obama’s plan to withdraw combat troops a “white flag of surrender”. 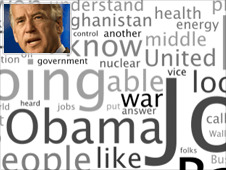 Mr Biden countered by saying Mr McCain had been “dead wrong” on Iraq and had yet to present a plan to end the conflict. He said the US was wasting $10bn a month in Iraq while ignoring the real front line in the fight against terrorism, Afghanistan. In turn, Mrs Palin said Mr Obama was naive for saying he was willing to talk directly to the leaders of Iran, North Korea and Cuba. “That is beyond bad judgment. That is dangerous,” she said. The pair also sparred on the issue of climate change. Mrs Palin, governor of energy-rich Alaska, said human activities were a factor in climate change but that climatic cycles were also an element. She urged US energy independence as part of the answer. 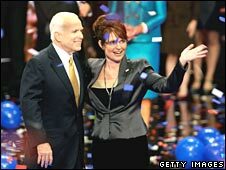 While Mrs Palin described her party’s candidate as “the consummate maverick”, her rival argued that Mr McCain had followed the Bush administration’s policies on important issues such as Iraq. “He’s not been a maverick on virtually anything that people talk about around the kitchen table,” Mr Biden said. They also noted how Mr Biden appeared emotional as he talked about raising his two young sons alone after a car crash killed his first wife. According to a Pew Research Center poll, two-thirds of voters planned to follow the debate, far more than in 2004. A new poll by the Washington Post suggests that 60% of voters now see Mrs Palin as lacking the experience to be an effective president. One-third say they are less likely to vote for Senator McCain, as a result. Independent voters, who are not affiliated to either political party, have the most sceptical views of the 44-year-old Alaska governor. 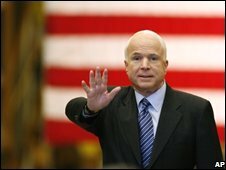 Another poll, for CBS News, gives Senator Barack Obama 49% to 40% for Mr McCain. It is the latest in a series of opinion polls that have shown a significant shift in the direction of Mr Obama since the economic crisis began. Mrs Palin, whose fiery speech at last month’s Republican convention inspired Christian conservatives, produces unusually strong feelings – both positive and negative – among voters. Although Mrs Palin has succeeded in mobilising conservative Republicans, her key challenge is to appeal to the swing voters who could determine who will win the battleground states, analysts say. In particular, she needs to win over the “Wal-Mart moms” – white, working-class married women. A recent poll of customers of discount giant Wal-Mart suggested that Mr McCain was slightly ahead with this group in Ohio and Florida, while Mr Obama was leading in Virginia and Colorado. Meanwhile, the McCain campaign is scaling back its operations in another swing state, Michigan, effectively conceding the advantage to Mr Obama there. 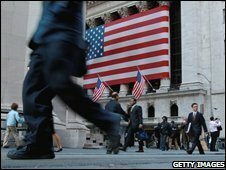 The US House of Representatives is preparing to vote on a $700bn (£380bn) plan to rescue the US financial sector. Party leaders are hoping the House, which stunned global markets by rejecting the initial plan, will follow the Senate and back a new version. The House began debating the deal on Friday morning and is expected to vote later in the day. The Senate bill added about $100bn in new tax breaks in the hope of gaining more support from House Republicans. 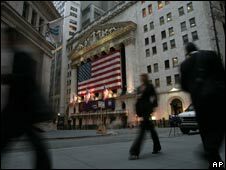 The New York stock exchange opened shortly after the debate began and the Dow Jones Industrial Average jumped more than 100 points in early trading. But earlier in Japan, shares fell to a three-year low. The Nikkei index closed down more than 1.9%, its lowest level since May 2005. In Europe, shares were relatively flat. In early afternoon trading the UK’s FTSE 100 was down just 18 points, France’s Cac 40 was down nine and Germany’s Dax up seven. The financial volatility continued on Friday as US bank Wells Fargo announced it would buy troubled rival Wachovia in a $15.1bn (£8.5bn) deal. The US also reported its biggest monthly job loss in more than five years. In Washington, House Speaker Nancy Pelosi, a Democrat, has said no vote will be scheduled until the party feels it will pass. “We’re not going to take a bill to the floor that doesn’t have the votes. I’m optimistic that we will take a bill to the floor,” she said. When the House first rejected the plan on Monday – by 228 votes to 205 – legislators had concerns about both the content of the plan and the speed with which they were being asked to pass it. President George W Bush has since urged the House to back his revised bill. The package is aimed at buying up the bad debts of failing institutions on Wall Street. Both the Democratic and Republican parties are pressing their members in the House to swing behind the revised bill and party leaders expect it to pass. Some members have called for more amendments, which opens up the prospect of further horse-trading up to the point at which votes are cast. Pressure will particularly be applied to the 133 House Republicans who went against party affiliation to reject President Bush’s bill, correspondents say. Tennessee Republican Zach Wamp, one of those who voted against the bill on Monday, said he would now vote in favor of the measure despite ordinary Americans remaining “as mad as heck” at the situation on Wall Street. The bill successfully passed through the Senate on Wednesday after it was amended to raise the government’s guarantee on savings from $100,000 to $250,000. It also now includes tax breaks to help small businesses, expand the child tax credit and extend help to victims of recent hurricanes. Most importantly, it extends the tax break aimed at boosting the provision of alternative energy such as wind farms. It also includes a number of so-called “pork-barrel” measures including tax cuts for rum manufacturers in Puerto Rico and the owners of racetracks. The additional cost of these unrelated tax breaks – which could add $100bn to the bill – have worried some fiscally conservative Democrats in the House of Representatives. Democratic and Republican Senate leaders have appealed for a new version of a $700bn (£380bn) Wall Street bail-out to be approved in a key vote. Republican Mitch McConnell said it would shield Americans from “shockwaves of a problem they didn’t create”. The plan needs support in the Senate and House of Representatives, which rejected a similar bill on Monday. Senate Democrat Harry Reid said he hoped a strong show of bipartisanship would “spark the House to do the same”. President George W Bush has been speaking to senators ahead of the vote. The White House said it hoped to see “strong support for the bill”. “It’s critically important that we approve legislation this week and limit further damage to our economy,” said spokesman Tony Fratto. US presidential hopefuls John McCain and Barack Obama are returning from the campaign trail for the vote, which is due to begin late on Wednesday. Global shares were mixed in Wednesday trading ahead of the vote. By early afternoon on Wall Street the Dow Jones was down 0.2% or 30 points. But hopes that enough changes had been made to get the bill through saw shares close up strongly in Asia on Wednesday. In Europe, the UK’s FTSE 100 finished 1.1% higher at 4,959.6 points, France’s key index added 0.6% while German shares fell. Changes to the rescue plan involve lifting the US government’s guarantee on savings from $100,000 to $250,000 and a package of targeted tax breaks. They are designed to answer critics who felt the original plan was weighted too much in favour of Wall Street while not enough was being done to help struggling American families. To get through the Senate, the bill will require backing by 60 of the 100 senators. It would then return to the House of Representatives for a vote on Thursday or Friday. Some members of Congress continue to press for more fundamental changes to the bill. President Bush has warned of “painful and lasting” consequences for the US should Congress fail to agree a rescue plan. The House’s rejection of the earlier version of the plan on Monday led to sharp falls on world stock markets. In election campaigning on the eve of the vote, Mr McCain and Mr Obama urged politicians of both parties to work together to pass the emergency legislation. Speaking in Reno, Nevada, Mr Obama warned that without action by Congress “millions of jobs could be lost, a long and painful recession could follow”. Mr McCain, who campaigned in Des Moines, Iowa, said inaction by Congress had “put every American and the entire economy at the gravest risk” and that Washington urgently needed to show leadership. “I am disappointed at the lack of resolve and bipartisan goodwill among members of both parties to fix this problem,” he said. The vote comes a day before a TV debate between vice-presidential candidates Joe Biden and Sarah Palin. Mr Biden, Mr Obama’s running mate, is also expected to take part in the Senate vote. Meanwhile, ex-President Bill Clinton is to hold his first rally for Mr Obama. Mr Clinton, whose wife Hillary lost to Mr Obama in a fierce primary contest for the Democratic nomination, is due to appear in Florida, where he will encourage people to register as voters before a deadline on Monday.